North Myrtle Beach vacations are full of play time, regardless of your age. Play golf. Play on the beach, in the pool, at the water parks, in the ocean and of course, in your fabulously designed one- or three-bedroom North Myrtle Beach vacation condominium. Tidemaster is a large North Myrtle Beach condominium complex with an oceanfront swimming pool. These inviting North Myrtle Beach condo rentals boast convenient amenities that will be a spectacular backdrop for your North Myrtle Beach vacation. Located on the oceanfront Tidemaster is an oceanfront North Myrtle Beach resort your family will love. The nicely appointed North Myrtle Beach vacation rentals of these North Myrtle Beach getaways feature a fully furnished kitchen with a dishwasher, just like home. After enjoying a sunny day on the white, sandy beaches, walk to your comfortable North Myrtle Beach condominium where cool air conditioning will greet your family and encourage you to relax in the living area. 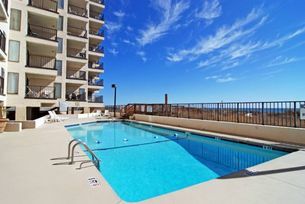 Right outside the door of these North Myrtle Beach vacation condos is the sparkling blue swimming pool where a refreshing dip just might be the start of a wonderful vacation agenda in North Myrtle Beach, South Carolina. The North Myrtle Beach neighborhood in which you will find Tidemaster is Ocean Drive, a popular area where the beaches are pristine and the beach music is enticing. Tidemaster is an ideal location for your next North Myrtle Beach vacation if you love golf because the Myrtle Beach, South Carolina area boasts 100 golf courses, from executive 18 holes that are lit for evening play to beautiful courses that run alongside the Intracoastal Waterway. North Myrtle Beach shopping is yet another reason families love to vacation in the North Myrtle Beach, SC area. Antique stores, boutique shops and outlet malls transform the shopping experience into memorable shopping adventures. North Myrtle Beach, South Carolina is a well known destination for live theatre entertainment that includes musical variety shows, holiday specials and big-name performances. With a dozen live theatre venues from which to choose, including some dinner theatre options, North Myrtle Beach, can fill your beach vacation agenda with live, family-friendly entertainment. Elliott Beach Rentals is not affiliated with onsite management or the HOA of Tidemaster.